Efforts to boost reconciliation between the 26 County state and Britain during the formal visit to London by 26-County President Michael D Higgins were undermined by a leading Tory’s call this week for the murder of Sinn Fein’s Martin McGuinness. The remarks cams embarrassingly at the start of a touted ‘new era’ in Anglo-Irish relations. As such, they were virtually suppressed by government spin-doctors, and an informal news blackout was observed by the mainstream media for almost 48 hours. Both Tebbit and his wife were injured in an IRA attack on the Thatcher’s war cabinet in Brighton in 1984. He said today [Friday] the remarks were “not meant to be taken literally”, but the controversy has continued amid calls for his prosecution under Britain’s anti-incitement legislation. The presence at the royal banquet in Windsor Castle of McGuinness, a, former IRA commander, created a furore on both sides of the Irish Sea. McGuinness went further on Tuesday by raising his glass to toast the English queen and standing to attention for the British national anthem -- part of ‘protocol’, his spokesperson said. 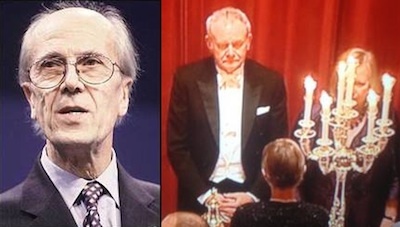 But there were no reports that he bowed his head to the queen, as Tebbit predicted. Photographs from the event showed McGuinness looking sombre as ‘God Save the Queen’ played, and raising his glass only marginally for the toast. Despite recurring allegations that he worked for years as a British informer, no Irish politician has ever publicly called for his assassination But hatred for the Sinn Fein Deputy First Minister among republican traditionalists is at an unprecedented level, and Tebbit’s incendiary comments recalled for some the death in an IRA ambush of pro-Treaty commander Michael Collins towards the end of Ireland’s Civil War. The comments undoubtedly spiked the political atmosphere at the royal banquet. McGuinness said only that they were “not fitting” for someone in Tebbit’s position. He said he would not be drawn into a row over the comments: “I’m not going to make an issue of it”, he told reporters. He described Martin McGuinness as “a leader of political and personal courage” who had worked to ensure the success of the peace process “at considerable risk to himself”. “Martin, his home and indeed his family have been targets for abuse and attack by so-called dissident republicans. “To now have this type of activity encouraged by a member of the British House of Lords is unacceptable, and should be rejected by all right-thinking people. David Cameron and other Tory leaders made no comment on the matter, but on Thursday British Direct Ruler in Ireland, Theresa Villiers, finally described the remarks as “highly dangerous” and “unacceptable”.